Robert Stewart established his laundry business in Melbourne in 1979 with the aim of achieving financial independence, and creating employment opportunities for his family. Almost four decades later, Complete Workwear Laundry Services is an award-winning company servicing the airline and manufacturing sectors, and employing more than 40 staff – including Robert’s son Jason and daughter Nicole. 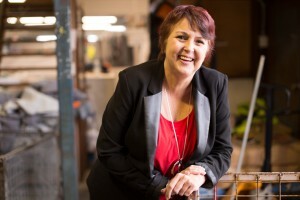 Owner and manager of Complete Workwear Laundry Services, Nicole Stewart. 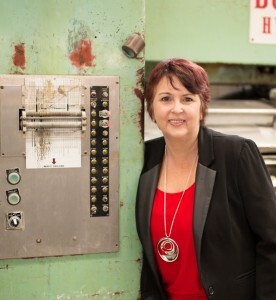 Nicole Stewart joined Complete Workwear 28 years ago, and first began discussing buying the company from her father in 2009. It wasn’t until 2015, however, that she finalised the purchase and became a second-generation owner of the company. Nicole explained the delay: ‘Dad was procrastinating, and it took about six and a half years from where we first began discussing the option of my buying the company to him saying, “I’m happy to let you buy it.” … However, I think that was in part due to him being worried about me taking on debt. I’m a single mum with kids to look after, and he was really worried about that side of it. Indigenous Business Australia (IBA) backed up Nicole’s determination through its Business Development and Assistance Program. Before approving her loan application, IBA assisted Nicole with business planning support. This included connecting her with an independent external advisor. As standard business practice required Nicole to question the valuation of her father’s company, that independent advisor was able to guide and advise her throughout that process. And that in turn enabled Nicole and her family to undertake informed sensitive legal and financial negotiations. ‘And it did get sensitive,’ said Nicole of those negotiations, ‘so it was brilliant to have that third party advice about the value of the company behind me’. Keeping the lines of communication open remains a priority as Nicole, her brother and father transition into their new roles. Having worked alongside her father for almost three decades, Nicole understands his reluctance to step away completely from the company he built. ‘Dad took a big leap when he left a full-time job to focus on this business, especially as he was supporting a family of four kids aged 4 to 12 … But he made it work’, she said. Since approving Nicole’s loan application, IBA has provided ongoing access to advice and mentoring via a member of its national network of business consultants. Their focus is implementing solid administrative and financial systems that will assist Nicole to achieve her growth strategy for the company. Achieving that strategy though requires Nicole to make some tough business decisions: ‘That’s probably one of the hardest things about being a business owner …’, she said. ‘We have staff who have been here for 20 years. We know them, we know about their family life, their kids, who’s getting married, their grandbabies, and so on. ‘You do have a connection with people … but you still need to step back and say, “I’m running a company; I’m trying to keep 40 people employed, and to do that I need to change this, this and this”’. Nicole has appointed team leaders from amongst her staff to free up time to work on growing the business. Another focus is diversifying Complete Workwear’s customer base. Until recently, about 85 per cent of its business came from airlines, but the historical volatility of the industry means demand can change very quickly. ‘When Dad first started the company, laundering general workwear was a big part of our business. But as we got more airline work we let companies go and didn’t fight as hard to keep them when their contracts came up. ‘The airline crises caused by 9/11 and the SARS virus, which stopped planes flying almost overnight, brought home that it’s a really dangerous thing to have all your eggs in one basket. A big focus for me therefore is to diversify back into other sectors again’. Using her company’s Supply Nation Indigenous Certified Supplier status Nicole also hopes to explore joint venture opportunities with other Indigenous suppliers. ‘So if there’s an Indigenous company doing something like, say, promotional or branded workwear, and they’re discussing procurement with a company, then they can add, “And, by the way, I can connect you with an Indigenous business to launder that workwear.” And vice versa’. In 2014, and with support from IBA, Nicole took up a Supply Nation invitation to join a delegation of certified suppliers at a major business trade fair in the United States. Also in attendance was her friend and mentor, Aboriginal entrepreneur and CEO of Outback Global, Jasmin Herro. ‘At that conference, Jasmin put a bigger picture into my mind by saying, “You have a business; you operate nine hours in a day. There’s another 15 hours a day; why aren’t you using your machinery?” So I’m now considering having a second shift of work happening where we get our airline work done early in the day and then have a second crew come in and do, say, flat sheet laundering for motels’. Asked how she’s adapting to being a second-generation business owner, Nicole said: As an employee, I could pull the pin at a certain time of the day and think, “I’ll worry about that tomorrow.” Now it’s my business, I’m finding it’s “No, get that out of the way because you don’t know what will pop up tomorrow.” So I’ve been working a few more hours’. To help her deal with what ‘pops up’, Nicole is harnessing one of the company’s greatest assets—its experienced and loyal staff. Blending tradition with a brand new vision, Nicole is excited about the future of the company. ‘I’m smart enough to realise that I can’t do everything on my own’, she said. ‘I also need to ensure there is someone here in the office during standard business hours. So in the next six months I’d also like to employ a manager … because people don’t understand or necessarily care that I’m here from 4 am, but not here when they want to do business at 4 pm. I won’t want to be missing business opportunities at any time of the day’. Nicole is grateful she approached her father on the potentially delicate subject of succession planning when she did. It means she can continue to draw on his experience and knowledge as she steers Complete Workwear into a future which she hopes will include a new factory and new machinery. ‘Because I know what we are,’ she said, ‘and I know what we can become’. Find out more about Complete Workwear Laundry Services and IBA’s Business Development and Assistance Program.